The field or wild Thyme is a small, much-branched shrub, about one foot high, with rather slender, quadrangular, purplish, pubescent stems. Leaves small, opposite, sessile. Flowers numerous, in clusters in the axils of the upper leaves. Corolla purplish, irregular; calyx green and persistent. The plant is propagated by means of underground stems. It is far from being a showy plant. 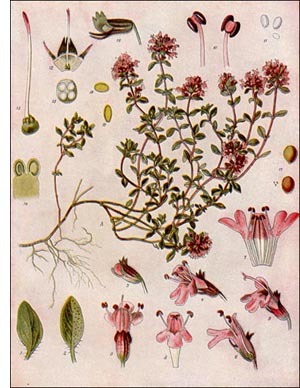 This plant is closely related to the garden thyme, and grows profusely in meadows, fields, and gardens. Both species are very fragrant, and it is to this characteristic that they owe their popularity. The ancient Greeks and Romans valued thyme very highly and made use of it as a cosmetic, in medicine, and in veterinary practice, much as it is used at the present time. Thyme yields the oil of thyme, which is a valuable antiseptic, used as a gargle and mouth wash, for toothache, in, dressing wounds and ulcers, also for sprains and bruises, in chronic rheumatism, etc. It finds extensive use in the preparation of perfumes and scented soaps; but its principal value is in veterinary practice. The herb is much used as a flavoring agent in soups and sauces, in fomentations, in baths, and in the preparation of scented pillows. Two kinds of oil of thyme appear upon the market, the red oil and the white oil. The latter is less aromatic, being the product of redistillation. The oil is also known as oil of origanum. Although thyme is an insignificant plant, as far as appearances are concerned, yet it has been sung by many poets.